Two superb performances reprieve an overhyped and overlong affair. Set in 1950s New York, a department-store clerk (Rooney Mara) who dreams of a better life falls for an older, married woman (Cate Blanchett). I think this was another case of hype being a hindrance. I don’t know what I was expecting BUT somehow it didn’t quite deliver. The pace was far too long. I didn’t mind watching the slow burning romance blossom BUT that there wasn’t much else. Romance movies were never my forte and the subject matter wasn’t as engaging as I had hoped. I mean it in the best way because their relationship seemed so normal. With the legalisation of gay marriage and the rise of movies focusing on the gay rights movement and gay characters, it has marked a progressive change in perception. All I saw was a normal relationship between two people. Of course, what helped was good characters and great acting that allowed you to buy into it. Blanchett and Mara were superb. They had fantastic chemistry and really made the relationship work. The meandering pace really didn’t help things. It dipped in and out. This could have been done in 90 minutes and been better for it. The 50s controversial context gave it the much needed spice and things took a nastier turn when Carol’s husband Harge (Kyle Chandler – Friday Night Lights) came into the mix. You felt for Carol as Harge battles the court to take her daughter away. Fighting for full custody on the grounds of breaking a “morality cause”. His anger and obsession to control Carol was daunting stuff and allowed for some tense moments. His volatile mood swings and drunken stupor created a threatening menace. But beneath all that bravado was a man scorned. Carol is soon forced to make a decision to face the “moral” implications and have her dirty laundry about her previous relationships aired in the courts at the risk of losing her daughter or give up the love of her life. It was interesting watching Carol’s relationship with her previous lover Abby (Sarah Poulson – American Horror Story). A future glimpse of what could lie in store. A lonely woman haunting a big house. The closing 30 minutes picked up the pace. The love scenes were dealt with tactfully BUT it’s not as if both actresses have been shy in front of the camera before. Mara (The Girl with the Dragon Tattoo) played the confused Therese to perfection while Blanchett proved once again why she deserved that Oscar gold (Blue Jasmine) in a fantastic little scene as she pleaded with Harge one last time. Edward Lachman’s cinematography was very unflattering. It added a much needed realism to the piece BUT was far too grainy and just terrible to look at. Carter Burwell’s musical score created the perfect mood setting and worked really well with the scenes. I also didn’t expect to see Cory “The Riddler” Michael Smith from Gotham in a surprising supporting role. 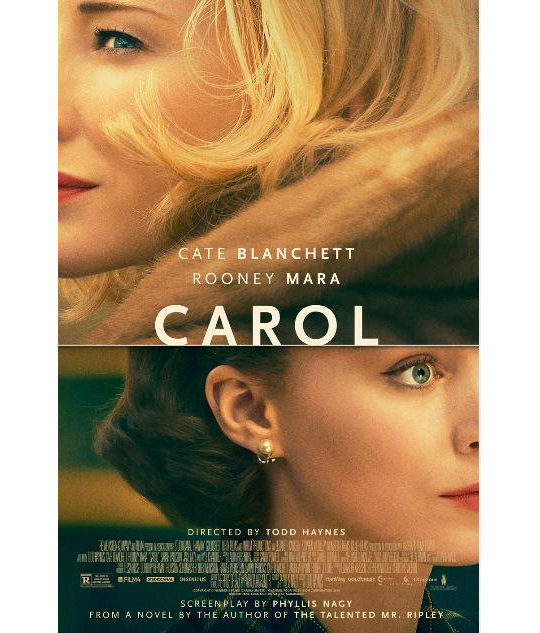 Carol was definitely worth a watch to see two fantastic actresses at their best BUT I needed a little more story told in a shorter pace. There were a couple of things I didn’t expect BUT it still ended with the same end result. Shame.